How to make a playful, multi-colored paper pinwheel wreath. Use up leftover squares of scrapbook paper to make playful pinwheels for this project. 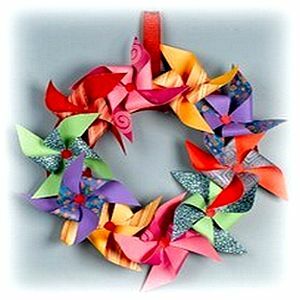 Paper pinwheels are fun to make and look lovely in this pretty paper pinwheel wreath. 1. Paint foam wreath red; let dry. 2. Cut ten 5″ squares from double-sided paper. If using single-sided papers, paste two sheets together back to back before cutting squares; let dry. 3. To create pinwheels, refer to Diagram 1 in our downloadable PDF Pinwheel Pattern. Use pencil to mark 2-1/2″ lines from corners of paper squares toward centers. Use craft knife and metal-edged ruler, or other cutting tool, to cut paper squares along these lines; do not cut all the way to center. Bring left corner of each side down to center and secure with glue gun. 4. Punch ten 1/2″ circles from solid red paper and glue to centers of pinwheels. Glue pinwheels side by side to wreath. 5. Glue ribbon ends together to create hanging loop; glue ends to top center back of wreath.